This week shouldn’t be too busy and so I am planning our usual four meals, with the other three to be either leftovers or something out of the freezer. It allows us the flexibility we need and prevents me from buying too much produce that would go bad and have to be fed to the chickens, rather than just feeding the girls the scraps. Today I went back to my trusty recipe box for some of our old stand-bys. 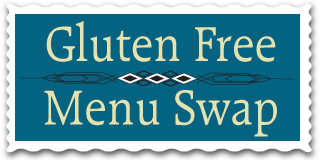 I also wanted to find a recipe that would work for this week’s Gluten Free Menu Swap theme of picnic or BBQ foods. This week’s swap is hosted by Heather at Celiac Family. 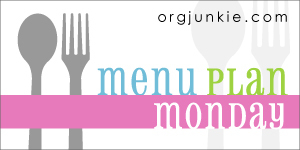 As always, this menu is also posted over at OrgJunkie where you can find hundreds of other meal plans for inspiration! Enjoy! on May 17, 2010 at 8:34 am | Reply Gluten-Free Dinner Plan for a Week. Thanks for joining the menu swap this week. I definitely need to try the Spicy Ginger Noodles. What brand and style of noodles do you use for it? I used to use Tinkyada brown rice pasta, either the spaghetti, penne or spirals. Now I use the Trader Joe’s version, which I think is Tinkyada for less money. Just be sure not to cook it too long. Let me know if you try it – it is one of our favorite ‘summer’ recipes. Glad you could join us for the menu swap. We do a recipe similar to the Spicy Ginger Noodles. I think I need to make that soon. Yum! Thanks for sharing the spicy ginger noodles and Italian white bean & polenta. Both of them sound like they would be a hit around here.